Toyota has targeted the sale of 5.5 million electrified cars per year by the year 2030 as part of a long-term plan which reaffirms the brands commitment to EVs. In an announcement about its future product plans Toyota also said that one million of the cars it sells each year will be “zero emission” by the target date after it creates a range of more than 10 EV models by the early 2020s. Additionally, by around 2025, every model in the Toyota and Lexus line-up around the world will be available either as a dedicated electrified model or have an electrified option. In addition to its new EV models Toyota aims to expand its PHEV line-up in the 2020s, with the introduction of higher-powered variants as it prepares to launch its “next-generation solid-state batteries”. Its hydrogen-powered fuel cell electric vehicle line-up, meanwhile, will also be expanded for both passenger and commercial vehicles in the 2020s. News of the drive towards electrification comes three months after the completion of a strategic partnership deal with Mazda and the Denso Corporation to speed up its development of electrified vehicles. The brand said that that its new electrified vehicle strategy was centred around “a significant acceleration in the development and launch plans of hybrid electric vehicles (HEVs), plug-in hybrid electric vehicles (PHEVs), battery electric vehicles (BEVs), and fuel cell electric vehicles (FCEVs)”. In October 2015, Toyota launched the Toyota Environmental Challenge 2050, which aims to reduce the negative impact of manufacturing and driving vehicles as much as possible. 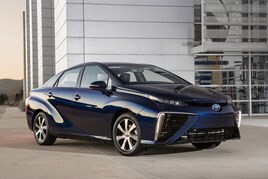 Toyota aims to reduce global average new-vehicle CO2 emissions by 90% from 2010 levels under the plan. It said that today’s announcement was “the main pillar” of a mid-to-long-term initiative to achieve this challenge. Announcing a focus on a separate element to the challenge Toyota said that it would focus on the development of a social infrastructure conducive to the widespread adoption of electrified vehicles. Its plans include the creation of a system to help streamline battery reuse and recycling, as well as support of the promotion of plug-in vehicle charging stations and hydrogen refuelling stations through active cooperation and collaboration with government authorities and partner companies. A statement issued by the manufacturer said: “Toyota has been a leader in making vehicles while keeping the environment in mind. This is evident through the introduction of the iconic Prius 20 years ago, as well as the launch of the world’s first PHEV, the Prius PHV, in 2012. “The second-generation Prius PHV, introduced in 2017, further increased the vehicle’s electric mode cruising range. “Additionally, in 2014 Toyota launched the world’s first mass-produced fuel cell sedan, the Mirai, which is being well-received by customers in Japan, the US, and Europe.